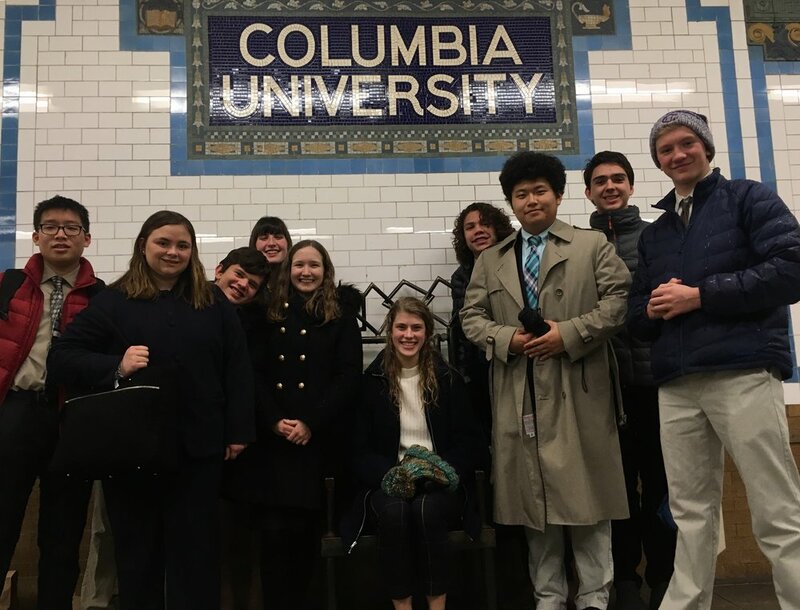 Model UN delegates wait for the train at the Columbia University subway stop. In addition to honing their debate skills, they learned to navigate the NYC public transportation system. Ten members of the CIS Model United Nations team traveled to New York City to participate in Columbia University’s annual Model UN Conference and Expo earlier this month. It’s the second year the team made the journey to this prestigious conference, which included schools from across the United States, South Korea, Guatemala, Mexico, and New Zealand. Borui Zhang and Marcus Hauan pose after being recognized for excellent performances in their committees. Delegates from CIS debated, negotiated, and deliberated on topics ranging from the Civil War in President Lincoln’s cabinet to interplanetary governance 300 years in the future. The entire team performed with aplomb, and sophomore Marcus Hauan, and junior Borui Zhang were honored with verbal commendation, and outstanding delegate awards, respectively. “When you put enough heart and soul into it, you get something great out of the experience,” said junior Borui Zhang. Abigail Reardon composes a crisis note during a moderated caucus on the Taiping Rebellion. Crisis notes are a way to exercise powers outside of traditional debate. Currently the team is writing a crisis conference simulation for CIS eighth graders. The team will travel to Chicago in April to participate in Northwestern University’s MUN Conference to wrap up the semester. Model UN is open to all upper school students at CIS. It builds on a tradition of global education and engagement here, and provides opportunities for students to research, write, debate, and negotiate in dynamic committees setting at institutions of higher learning around the country. As part of their conference experience, students toured the United Nations.